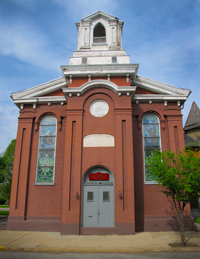 Located in the original English Evangelical Lutheran Church, Columbia Historic Preservation Society is dedicated to the preservation of the river town, formerly known as Wright’s Ferry and Shawana Town. Once considered as a possible site for locating our nation’s capitol, Columbia was once the gateway to the American West. In addition to offering published articles and books on the town’s history, the museum houses a model train display, artifacts, a research room, microfilm archive, and publications pertaining to the history of this Susquehanna river town. General inquiries can be directed to Christopher Vera. We have volunteer opportunities available and invite the public to assist in keeping CHiPS active and open to the public! Monthly meetings are scheduled for every first Monday of the month at 7 PM. We also have a Membership Meeting to elect new officers once a year the second Sunday in April. Columbia Historic Preservation Society is a 501(c)(3) non-profit organization.